Searching for Thoreau vividly transports the reader to the places in New England that were most important to the great American writer/naturalist Henry David Thoreau in 10 vigorous essays that range from Walden Pond to the shores of Cape Cod and the heights of Mount Katahdin in northern Maine. The author, Tom Slayton, recounts his first-hand experiences comparing them to Thoreau's from 150 years earlier; he also compares their observations on the places themselves and their reflections on the causes of change, all with ample use of excerpts from Thoreau's writings. When You Go section of practical information for each chapter. Illustrated with new sketches and maps. ABOUT THE AUTHOR: Tom Slayton, editor-in-chief of Vermont Life Magazine from 1986-2007, and a long-time commentator for Vermont Public Radio, has published books on various subjects related to travel, art, and literature, including Sabra Field, the Art of Place. He recently was granted an honorary Doctor of Humane Letters degree from the University of Vermont, and has also received an honorary doctorate from Southern Vermont College and the Franklin Fairbanks Award for outstanding service to Vermont and its people. He has spent more than 30 years studying the works of Henry David Thoreau and traveling to places associated with him. He has given public presentations and published several articles on those travels. Mr. Slayton is a member of the Green Mountain Club, the Appalachian Mountain Club and the 4,000-footers Club of the AMC. He lives in Montpelier, Vermont with his wife, Elizabeth. "Thoreau, more than any other American writer, belongs to the world. But he also belongs, specially, to New England, for this was the landscape that shaped his thought and mood. Tom Slayton has done something difficult in this wonderful book: shed new light on old Henry David, and in charming, funny, thoughtful prose that the master himself would have enjoyed!" Bill McKibben, author, educator, and environmentalist. 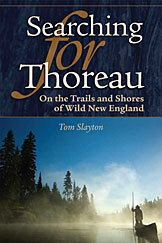 "This new book by Tom Slayton will be treasured by lovers of Thoreau and the New England landscape. Slayton's is an unusually lucid and engaging voice, allowing him to interweave a gripping, and sometimes amusing, personal narrative, literary discussion of a highly discerning sort, and a thoughtful reflection on the history and future prospects for conservation in the Northeast. My future explorations both of Thoreau country and of its literary expressions will certainly benefit from the vivid ways in which Slayton has mapped them here." "Tom Slayton's Searching for Thoreau is the most personal, engaging, and eloquent book I've ever read on New England's finest writer. By reading and rereading Henry David Thoreau, and following in his footsteps from Cape Cod to the deep Maine woods, Slayton has brought Thoreau's vision forward to the twenty-first century in a unique, surprising, and unfailingly entertaining literary memoir. I loved every page."